Date: Tues. April 1, 2014, 10:00 a.m.
MILWAUKEE: Protest/Leafleting at Federal Building, 3rd and Wisconsin Ave. on Wednesday, March 19, from 5 to 6 pm. ROCKFORD: A demonstration/leafleting in Rockford, IL. on Thursday March 20 at City Hall (425 E. State Street) from 2 to 3 pm. Sponsored by Rockford FIST. Durham, North Carolina March 14, 2014. The threat is real. Sanctions, war build up, warships with guided missiles to the Black Sea, F-15 fighter jets on Russia’s border are dangerous provocations. Washington has recognized and committed more than $10 billion to an illegal right-wing government that seized power from elected officials. Actions large and small are urgently needed — informational picket lines, visits to congressional offices, protests at media centers against war propaganda, vigils, and challenges to government officials. Let’s make our voices heard. Ukraine: Say NO To Another War! Say NO to another U.S. war! 49th St. & 6th Ave.
Corporate media have always lied about the reasons for war, from Vietnam and Iraq to Libya and Syria. If you turn on CNN or FOX News, read the New York Times or listen to NPR, you aren’t getting the real story. Here are 10 things the U.S. corporate media won’t tell you about what’s happening in Ukraine. 1. Washington planned the coup in Ukraine. U.S. State Department official Victoria Nuland was caught on tape plotting who would be the next head of Ukraine. She bragged that the U.S. had spent $5 billion funding the so-called democracy movement there. Senator John McCain went to Kiev, spoke at rallies and was photographed with the leader of the fascist Svoboda party. Neo-Nazi forces took over buildings and threw out the elected government in a coup d’etat, then passed new laws with no quorum in the parliament. 2. There has been no Russian invasion. Washington officials have threatened Russia for “invading” Ukraine. It’s a Big Lie meant to cover up U.S. involvement in the coup. Russia has a military base in Crimea, a predominately Russian ethnic area, and is legally allowed to station up to 25,000 troops in the country. Russia has said it may act to protect civilians if they are threatened by the neo-Nazis in Kiev. That is all. 3. The U.S. war buildup. The Navy has deployed the USS Truxton, a warship armed with guided missiles, to the Black Sea. Six F-15 fighter jets and 60 military personnel have been sent to Lithuania, in addition to those already stationed there. The U.S. and EU are imposing sanctions and travel bans on Russian officials. Politicians from Hillary Clinton to John McCain have compared Russian President Vladimir Putin to Hitler. When preparing for war, the U.S. always uses this bogus comparison to demonize leaders of opponent countries. 4. Neo-Nazis dominate the new government. The openly racist, anti-Semitic and pro-Hitler Svoboda party is one of three major parties in the government. Svoboda led the street actions that forced elected President Yanukovych to flee. The Right Sector, armed fascists who have beaten opponents and vandalized public property, are now in charge of the military. Immediately after the coup, Ukraine’s chief rabbi, Moshe Reuven Azman, urged Jews to flee Kiev. The government’s first act was to ban the use of Russian and other minority languages. Opponents of the coup have been beaten, disappeared, or had their offices and homes vandalized and burned. 5. Coup leaders hired snipers to justify their takeover. A leaked call between Estonian and European Union officials reveals that people behind the new government hired snipers to kill protesters and police in Kiev. President Yanukovych was blamed for the killings and this was used to justify the coup. 6. 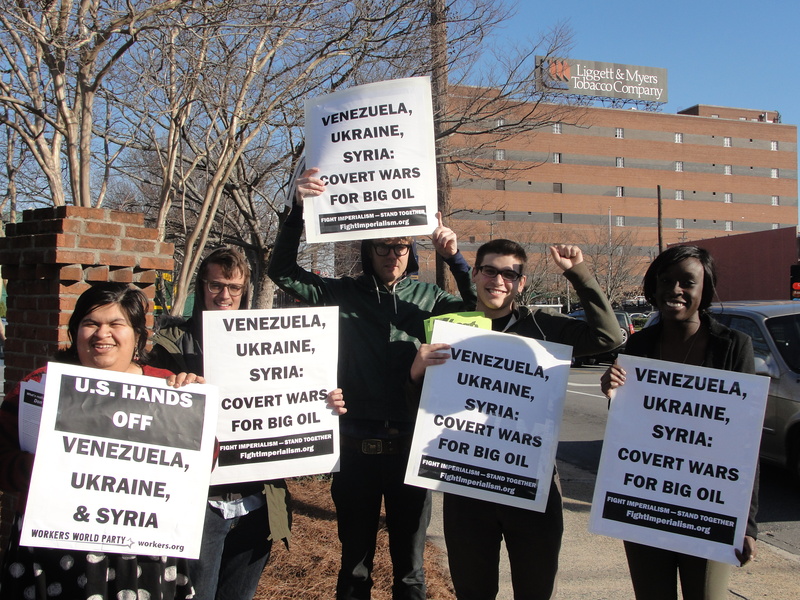 Wall Street and Big Oil want to control Ukraine – and Russia. Oil and gas pipelines in Ukraine bring fuel from Russia to Europe. Big Oil wants to control the pipelines to cut the flow from Russia and hike their own profits. The U.S. has even offered the new government gas from dangerous fracking drilling here! Russia is the world’s largest producer of gas, oil and industrial minerals. They want to break up Russia too. Wall Street would love to get its claws deeper into Ukraine and Russia – to drive up profits and push down wages for workers here and there. 7. NATO’s drive to expand. As part of the Western drive to dismantle Russia, the Pentagon wants to establish military bases on the Ukraine/Russia border. The U.S. dominated NATO alliance has expanded aggressively into eastern Europe in the past 20 years, adding 12 countries to its roster so far. U.S./ NATO forces continue to occupy Afghanistan to the south. 8. 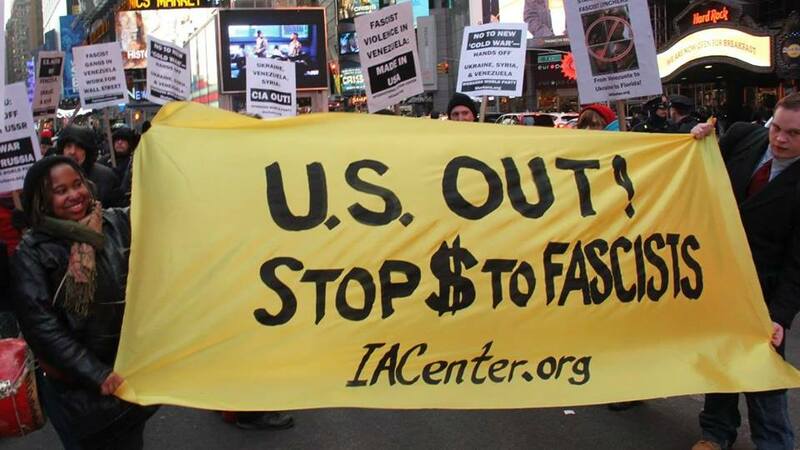 Billions for coup in Ukraine, cuts for food stamps in U.S. In early February, Congress and the Obama administration agreed to cut SNAP food assistance benefits for hungry families by $8.7 billion, claiming there’s no money. Yet just weeks later, they announced $10 billion in assistance to the neo-Nazis in Kiev. Secretary of State John Kerry personally delivered the first billion on March 4. 9. Power for the 1%, misery for workers. The new regime has appointed wealthy oligarchs as governors of rebellious regions of Eastern Ukraine. It’s also agreed to an IMF austerity plan drafted by Washington to cut workers’ pensions, unemployment insurance and social programs – just like the cutbacks workers from Detroit to Greece face. 10. People across Ukraine are fighting back. People in Eastern Ukraine and throughout the country are organizing against the coup. Some have taken over regional and city buildings and refused to hand them over to the new authorities. Others are marching on military bases and demanding that the troops not obey the commands of the neo-Nazis in Kiev. Some are calling on the Russian government to protect and assist them. The people of Ukraine remember well what Nazi rule was like during World War II, and they will not stand for it again. Join us! Educate, organize and protest. Let’s stop the next U.S. war before it starts.